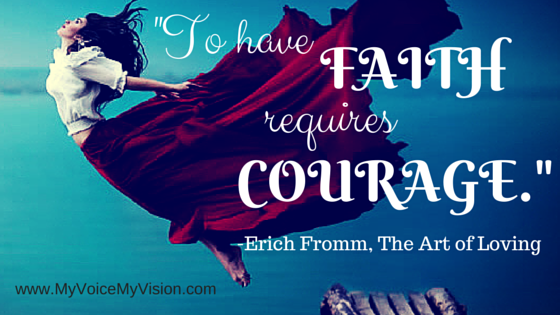 To Have Faith and Courage While Being Afraid – My Voice. My Vision. Earlier this week a California judge ordered that actress Kelly Rutherford’s two young children be returned to the United States after an appallingly bad decision from another judge that the children be ripped from their mother and only known caregiver to go live with their German father in France because his visa had expired. If that seems like the longest, most screwed up run-on sentence you’ve ever read it’s because it is. After six years of fighting in appellate courts and running up legal fees that sent her into bankruptcy, Kelly’s dedication to her children paid off. I have never been so emotionally overcome by a “pop culture” headline. I was suddenly filled with so much hope and found the motivation to keep going. To bring you up to speed my ex and I have spent the last three years in and out of family courts. While I have been representing myself because of financial disparity he has appeared before the judge with a criminal defense attorney every time. Why would someone hire a criminal defense attorney to handle their divorce and custody case you ask? Because she was already on the books since a whole team of defense attorneys got my ex out from under a sexual assault charge filed by a 19 year old employee at our restaurant prior to our separation, that’s why. Convenient for him, no? When it became clear that he had lost me my son’ father finally wanted to spend time with his son, the one he’d repeatedly told me he didn’t want. Not only that, he wanted custody and told the courts I was a danger to my son. Opposing counsel hired a forensic psychologist to do a best interest evaluation to help the court determine custody of our then two year-old son. Thanks to the wisdom and support of all of the women at One Mom’s Battle I was prepared for everything that they threw at me during that time. Don’t get me wrong, it wasn’t any easier to take emotionally, but I wasn’t taken by surprise. I already had their playbook. For months I gathered evidence to prove the abuse I suffered at the hands and tongue of my ex. There were emails, texts, photos, and certifications from witnesses. I put together a long list of lies he had told the court in previous certifications and backed them up with evidence to the contrary. At some point during the marriage I managed to find the sense to keep a brief journal of the abuse that was happening in our home. I put together a timeline of our relationship and abusive events. The evaluator was told of how and given evidence of my ex violating court orders by showing up at my front door unannounced and leaving things on my car. I had taken a threat assessment during a forensic nursing class I took that semester at Penn State. The week we covered domestic violence was the most terrifying week of my life. It was the first time I had realized that my son and I were in extreme danger. The Mosaic threat assessment was created by Gavin De Becker, author of “The Gift of Fear” and risk assessment expert. The Mosaic method measures the current situation against past situations where the outcomes are known. When I first took the assessment in April of 2013 I thought that on a scale of 1 to 10, 10 being the highest level of threat, that maybe we would be at a 4. I was shocked to learn that our situation rated at an 8. Two months later when I retook the assessment after my ex began violating the protective order I had sought to keep him away from my home, our rating had increased to a 9. Based upon the information you have provided, and with a quality level of 173 out of a possible 200, this situation appears most similar to cases that have worsened and escalated. On a scale of 1 to 10 (10 being assigned to the worst situations), this situation is a 9. Some similar cases have escalated to include worsening abuse, substantial violence, and even homicide. This situation definitely carries a high risk for Victim, and steps to enhance safety and wellbeing are called for. Consider learning about immediate options and resources by contacting the National Domestic Violence Hotline: www.thehotline.org or 1.800.799.SAFE (7233). The quality of any assessment depends upon the accuracy, value, and amount of information considered. Since information is not all of equal value, points are assigned to each question; the more points, the higher quality assessment is possible. Based upon the questions you were able to answer, the quality of this assessment can be expressed as 173 out of a possible 200 points. Generally speaking, fewer than 125 points will not provide sufficient insight for a quality assessment. The best assessments are based upon many factors considered together in context, however there are sometimes individual issues that call for attention on their own (no matter what results you might get on a scale of 1 to 10). Consider the ways children can be affected by the situation. Consider his history of assaultive behavior. Consider that he has violated court orders in the past. Consider his refusal to accept rejection. Consider that he resolves conflict aggressively. Consider the suicidal references by Offender. Consider Offender’s special interest in violence. Consider that he has stalked Victim. Consider that violent incidents have been frequent. Consider the severity of Offender’s violence. I printed this report and gave it to the evaluator. I repeatedly told him that I was scared for my safety and for the safety of my son. I handed him police reports and hospital records. At one of my later sessions with the evaluator I said that from what I had read and witnessed, I suspected that my then husband had Narcissistic Personality Disorder. I was afraid and seeking help. I needed his help and his recommendation to let me leave the state so I could have the much needed support of my family. During this investigation a Personality Assessment Inventory (PAI) was administered to both me and my ex-husband. I presented no diagnostic symptoms of any psychological impairment. My son’s father presented diagnostic symptoms that would indicate the presence of, you guessed it, Narcissistic Personality Disorder. I was enduring unrelenting abuse and not being allowed to seek comfort from my family, yet I had somehow managed to keep it together for my son. Despite these assessment results the evaluator recommended that I would benefit from treatment. He made no recommendations for treatment or further evaluation of my ex-husband. It is for this reason that I am now returning to court to ask the judge to order a full psychiatric evaluation and case history. As I am prepping for this court appearance I am returning to clinical articles about batterers as parents, personality disordered parenting, risk assessment for visitation, etc. It didn’t occur to me until tonight that despite everything I reported to him, our evaluator never once alerted local police of potential danger. Not once did our “best interest evaluator” recommend help or shelter to me. Not once did he alert the Department of Youth and Family Services that there was a case of potential abuse to investigate for my child. I trust he got paid a lot of money to make his recommendations and I hope that makes it all worth his while. I am a smarter, stronger woman now than I was two years ago. I have learned how to manage my ex-husband and his manipulative tactics. I know what to expect from the family courts. My divorce and custody mentor, Tina Swithin, received a final judgement last year granting full custody and no visitation for her ex with their two young daughters after four years of navigating the California courts on her own. Kelly Rutherford is in Monaco awaiting the return of her children after 6 years of fighting to protect them. I will not stop until I know my son is safe and I have faith that the courts will, one day, give us that protection.